If you are pressed for time, you should be purchasing boneless chicken breasts because they cook faster than chicken breasts with bones. They make good lunch and dinner recipes, including chicken pasta, Caesar salad, and sliced chicken breasts alone. Chicken breasts can dry out quickly so if you want to know how to cook chicken breasts, you should learn to cook them under high heat very quickly. You can stir fry, grill, roast, or cook chicken in a skillet. The USDA has instructions for cooking up the average-sized boneless chicken breast. This makes for about 4 ounces of meat, and should be roasted at 350 °F (177 °C) for 25-30 minutes. You need to do this in order to prevent live bacteria from remaining in the chicken breast. The internal temperature of the breast must reach 165°F (74°C). Because chicken breasts vary in size and ovens have differences in the amount of heat they put out, checking the inside temperature of the meat is the best way to assure safety when cooking chicken breasts. The main benefit of baking the chicken breast is that if you cook it right, the meat will be very tender and juicy when eaten. All it takes is chicken breasts, salt or pepper. You can add other seasonings like rosemary if you want to pump up the flavor. Back the chicken breast at 350 °F in a roasting pan for up to 30 minutes or until the thickest portion of the breast reaches 165 °F. If you want to know how to cook chicken breast, remember that this is an easy way. The only trick is that you have to cook them in covered pan so that the chicken breasts can be poached in their juices from the inside out. The stovetop method can be made just using plain chicken breasts. You can also marinate them in a brine before cooking or use various fresh herbs to enhance the flavor of the chicken breasts. They can be cooked in the covered skillet using a little bit of olive oil. 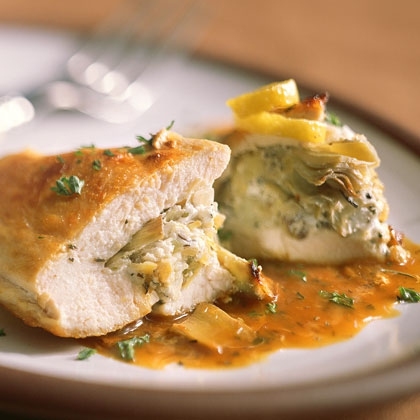 In order to make this recipe, you need to flatten out the breasts so that they are of an even width. Season with pepper and salt. Put the sauté pan up to medium high heat. When it is hot enough add butter or olive oil to coat the pan. Cook the breasts for a minute on one side. Repeat with the other side. The sides should be golden brown. Then turn down the heat to a low setting and cover the pan. Let the chicken cook this way for 10 minutes. Don’t lift the lid. Boneless, skinless chicken breasts are great when grilled but you can easily overcook them. Try first searing them on both sides and then indirectly grill them. First, in order to know how to cook chicken breast, you need a grill that has two levels of heat, one that is high and one that is lower. Oil the grilling grate with vegetable oil. For the best in flavor and moisture, you should marinate the breasts in a brine made of ¼ cup salt in 4 cups water. Sear them with the high part of the grill for about 3-4 minutes on each side, and then move them to the low side so that they can gradually cook after that. Apply barbecue sauce if you want added flavor. If you want to know how to cook chicken breast in a sauté pan, the best way it’s to stir-fry the meat with vegetables. Better still, you can use a flat-bottomed wok to avoid falling out of ingredients. Stir-fry is a very good way to cook chicken because it allows you to add all the ingredients and sauces all in the same pan. The ingredients you need are chicken breast, salt, pepper, olive oil, vegetables cut into pieces of a uniformed bite-size, onions, and perhaps ginger if you wish to do it Chinese-style. Simply cut up the chicken into strips and put them in a hot, oiled wok or sautéing pan. Add the onions and spices if desired and cook until the meat is slightly browned. Add vegetable and salt, then stir-fry for about 1 minute. - Diced pimientos, 1½ tbsp. - Minced green onions, 2 tbsp. - Lemon juice, 2 tbsp. - Hot sauce, 2 tbsp. - Canola oil, 1 tbsp. - Black pepper ½ tbsp. 1. Set oven to 350 °F. 2. Fry bacon until crisp in a skillet. Remove the bacon but keep the drippings. 3. Combine bacon, cheddar cheese, pimientos, minced green onions, fresh lemon juice, canola oil and ¼ tsp. salt. 4. Cut an inch wide slit into the thickest end of the chicken breasts. Stuff the breasts with the cheesy mixture. Secure the pockets with toothpicks. 5. Put ¼ tsp. salt and pepper over the chicken. 6. Heat a pan to medium-high temperature. Add oil to the drippings and add chicken to the cooking pan. Cook for 4 minutes and turn over. 7. Then bake in the oven for 12 minutes and let stand an additional 5minutes. - Low sodium soy sauce, 2 tbsp. - Lime juice, 2 tbsp. - Worcestershire sauce, 1 tbsp. 1. Mix first 6 ingredients together and put the chicken in a zip lock bag. Add ¾ cup of the beer mixture to bag and seal for marinating. Save the rest of the beer mixture. 2. Marinate in the refrigerator for an hour, shaking occasionally. 3. Mix rest of beer mixture with onions and bell peppers and marinate for one hour at room temperature. 4. Heat a grilling pan on medium to high heat and coat it with cooking spray. 5. Cook chicken for 2 minutes on each side and then keep warm. 6. Take out onions and bell peppers. Add to the pan and cook for 6 minutes until tender, turning after 3 minutes. 7. Toast the tortillas in a pan and put two on each plate. Add chicken mixture to top tortillas and top with onion mixture. Server responsed at: 04/20/2019 10:32 p.m.